← Did you know you can chat with us online? 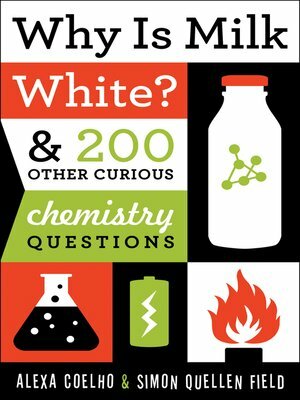 eBook Friday: Why Is Milk White? When it comes to chemistry, most kids have more questions than answers. Why do you get cavities when you eat too much sugar? How does sun block protect your skin from getting a sunburn? What makes soda so fizzy? And why do you need antifreeze in your car? Teenager Alexa Coelho quizzed her neighbor, chemist Simon Field, with hundreds of perplexing questions, and now she has the answers. Field covers a wide variety of concepts from simple to complex, but always with straightforward, easy-to-understand explanations. And for those readers who want to see chemistry in action, Why Is Milk White? also includes a dozen unique experiments to try at home. Lift latent fingerprints from a “crime scene” using super glue (for a glass or smooth surface) or iodine (for paper). Hollow out the zinc interior of a penny using muriatic acid, leaving only a thin copper shell. Conduct a paper chromatography experiment to separate food coloring into its component dyes. Or use easy-to-find chemicals to create plastic “slime,” Silly Putty, or a bouncing ball. This book is the perfect resource for budding scientists everywhere.